Dentistry at Perth is dedicated to enhancing and restoring the natural beauty of your smile by offering their expertise and dental procedures for adults, adolescents and children. 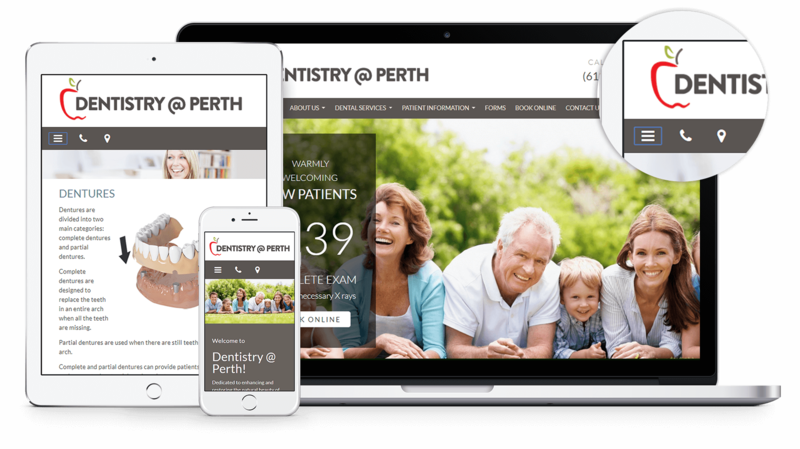 We are happy to announce the brand new website for Dentistry at Perth ! Dentistry at Perth is dedicated to enhancing and restoring the natural beauty of your smile by offering their expertise and dental procedures for adults, adolescents and children. The state-of-the-art dental care provided by Dentistry @ Perth covers the fields of orthodontics, dentistry (cosmetic, implant, sedation, general) and the special requirements of small children. The new website is built on a very user-friendly platform that has a very attractive layout throughout. The big main banner in combination with the menu bar make this website a one of a kind website. Patients have the ease of access combined with the multiple pages of information that will help them with anything that they may seek. Patients can contact the practice through email and they can also book an appointment through the website as well. They also have New Patient Paperless Forms that the patients can fill out from the comfort of their own devices. The new website can be accessed on all devices such as : smartphone, PC or laptop and any tablet since it has a responsive design.